Alright, Simpsons lovers, you asked for it. 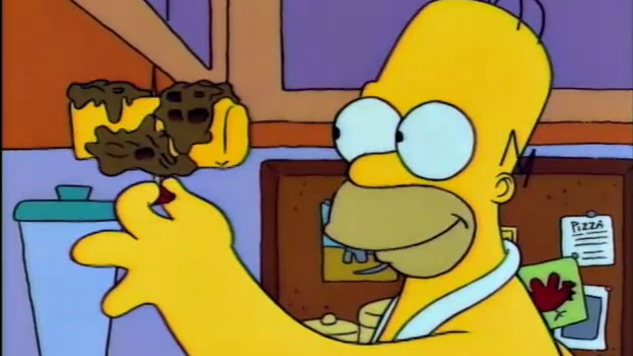 The time has come to make Homer’s infamous moon waffles. Prepare yourself. Not bad. This perfect day, plus a dream where God tells him he doesn’t have to go to church (“I usually dream about naked… Marge.”), leads Homer to drop Christianity like a healthy diet. Everyone tries to intervene, including Reverend Lovejoy and, of course, Ned. The Flanders have an action movie-style car chase as they pursue heathen Homer but don’t manage to sway his beliefs. Finally, Homer is home from church again and feeling pretty good about himself (“Everyone is stupid except me!”) when he drifts off to sleep and promptly catches the house on fire. Ned Flanders pulls him out of the burning house, winning Homer back over to Christianity. And now back to those moon waffles. Unlike many foods featured in The Simpsons, this one comes with clear instructions directly from Homer. I’ve laid them out for you below, along with step-by-step photos. Note that if you use my recipe, I am in no way responsible for the mess that it causes (think a solid 20 minutes of cleaning your waffle iron, all the while repeatedly considering just chucking it out the back door), or the resulting product. This is a Homer creation, created as instructed. Make at your own risk. Heat up your waffle iron. Open and add a handful of caramel candies. Top with too much waffle batter, and WAY too much liquid smoke. Shut the lid and step away (and maybe open a window or two). Once the waffle is done cooking, open and carefully peel off the waffle. You’ll leave plenty of caramel and burnt stuff behind (mmm…burnt stuff). Wrap it around a stick of butter as best you can and poke with toothpicks until it stays together. Eat like a hot dog that squirts melted butter while sitting in your living room in whitie tighties. Instead of using a napkin, let the dog lick up your mess. Leave the waffle iron for Marge to clean up. Verdict on Homer’s moon waffles: If you really, really like butter and things that taste like a pile of burnt wood, you’ll love this ridiculously messy dish. I’m not sure what to say other than look at that thing. It tastes like it looks. After washing the ridiculously intense taste of smoke and butter out of my mouth, I began to ponder a better-tasting and easier to eat version of moon waffles. I liked the idea of caramel, butter and a bit of smokiness together in a waffle, but the flavors needed reigning in, as did the mess. I was never cleaning another waffle iron like that again. A little tinkering and I came up with this: a browned butter waffle with a touch of brown sugar and vanilla topped with smoke-infused maple syrup. The flavors are caramel-y and buttery without being totally gluttonous, and by adding just a drop or two of liquid smoke to the syrup, you get a pleasant level of smokiness without killing your tastebuds. I highly recommend serving these light and crispy waffles with bacon, since it goes nicely with the sweet and smoky flavors. Plus, Homer would totally approve.